The Mii Swordfighter appears from a tornado. 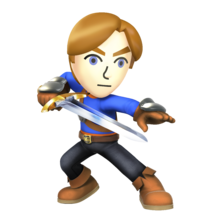 The Mii Swordfighter (written as Mii Sword Fighter in the PAL release) is one of the three variations of the Mii Fighters in Super Smash Bros. for Nintendo 3DS / Wii U and Super Smash Bros. Ultimate. As its name suggests, the Mii Swordfighter is a master of weaponry and uses a sword for a majority of its attacks. Of the three Mii Fighter types, the Mii Swordfighter has the median dashing speed, the fastest walking speed, and the lowest jump height, as well as the only Mii Fighter class that cannot wall jump. Like Palutena and the other variations of the Mii Fighters in Super Smash Bros. for Nintendo 3DS / Wii U, the Mii Swordfighter's custom moves are all separate moves rather than altered versions of the same move and all custom moves are available from the start. The Mii Swordfighter can also be fitted with unique outfits and hats. Mii Swordfighters cannot be used when playing With Anyone online, but can be used in battles against friends. 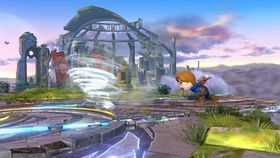 Gale Strike (named Tornado Strike in the PAL release) is the Mii Swordfighter's default standard special move in Super Smash Bros. for Nintendo 3DS and Super Smash Bros. for Wii U. When this move is used, the Mii Swordfighter spins in place then slashes, sending a swirling gale forward in a line. The gale speeds up as it moves, and hits enemies multiple times as it passes through them. If the gale slides off an edge, it will fall slightly before continuing forward in a straight line. The move is aesthetically similar to Link's Gale Boomerang, but behaves more like the Ore Club's tornadoes. The attack is also capable of destroying some objects, such as Diddy Kong's bananas. If an opponent touches the tornado during its final frames of animation, they will not take any damage and simply be lifted up (or pushed backwards) by it, boosting their recovery. If the Swordfighter uses Gale Strike in midair, they gain a bit of upwards momentum. Shuriken of Light is the Mii Swordfighter's second standard special move in Super Smash Bros. for Nintendo 3DS and Super Smash Bros. for Wii U. 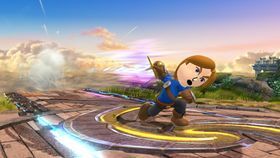 When activated, the Mii Swordfighter tosses a small, translucent yellow shuriken forward in a line similar to Greninja's Water Shuriken. The shuriken damages the first enemy it hits, then disappears. It is stronger if done from a distance, dealing 9% damage, while close up, it deals only 2% damage. Additionally, opponents do not flinch when they are hit from it up close (giving it some similarities to Fox's Blaster or the Mii Gunner's Laser Blaze), while when fired from a distance, it causes them to flinch. The Mii Swordfighter also gains super armor when they flash. Blurring Blade (named Blade Flurry in the PAL release) is the Mii Swordfighter's third standard special move in Super Smash Bros. for Nintendo 3DS and Super Smash Bros. for Wii U. The player charges the move by holding down the special move button, and when released, the Mii performs a flurry of sword stabs, followed by a single stab that deals greater damage and knockback depending on the charge. 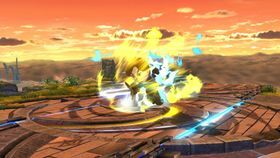 The charging animation and finishing blow are similar to Marth and Lucina's Shield Breaker, while the multi-hit portion of the attack resembles the fourth downward strike of Dancing Blade. In Super Smash Bros. Ultimate, the Blurring Blade move returns, but with a few differences: it now sets the Swordfighter's blade aflame for its duration, deals flame damage, and ends in an upwards slash, instead of an outwards thrust. 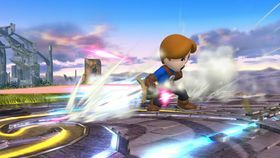 Airborne Assault is the Mii Swordfighter's default side special move in Super Smash Bros. for Nintendo 3DS and Super Smash Bros. for Wii U. 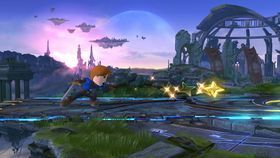 When used, the Mii Swordfighter charges up then launch themselves forward, similar to Sonic at the start of his Spin Dash, somersaulting with the blade. If contact with the foe is made, the Swordfighter delivers a single slash, which damages and knocks the opponent back while causing the Mii to gain some vertical height. 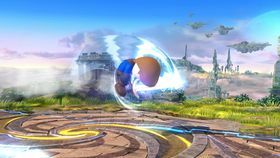 The move can be charged by holding down the special move button to increase the move's power and distance, and performing the move like a smash attack causes it to charge faster. If the move ends while in midair, the Mii is rendered helpless. Slash Launcher (named Surging Slash in the PAL release) is the Mii Swordfighter's second side special move in Super Smash Bros. for Nintendo 3DS and Super Smash Bros. for Wii U. Similar to Ike's Quick Draw, the player holds down the special attack button to charge the move, then the Mii dashes forward across the ground when the button is released, slashing any enemies in their path. The distance the Mii moves increases for as long as the button is held, and although the move only charges a certain amount, the Mii remains in place as long as the button is held. 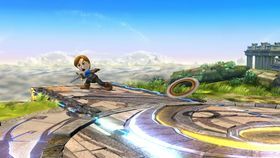 Chakram is the Mii Swordfighter's third side special move in Super Smash Bros. for Nintendo 3DS and Super Smash Bros. for Wii U. 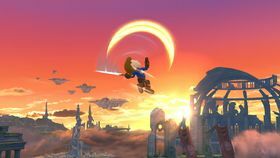 When used, the Mii Fighter throws a chakram forward. The effect of the move depends on the input. 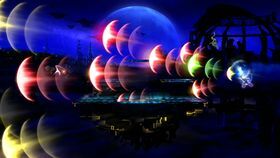 When used normally, the chakram slowly flies forward a short distance, dealing multiple hits to any fighter in its path and stalling in place before disappearing; when input like a smash attack, the chakram flies forward quickly and deals a single hit to any opponents in its path. The chakram can be thrown forward either up or down by tilting the analog stick. If a chakram is thrown at the ground, it will stick to the ground but cannot be interacted with. 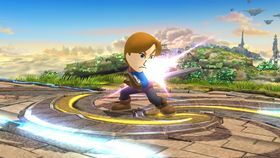 Stone Scabbard (named Back in the Stone in the PAL release) is the Mii Swordfighter's default up special move in Super Smash Bros. for Nintendo 3DS and Super Smash Bros. for Wii U. When used, the Mii leaps into the air with a slashing attack, then quickly descends back toward the ground with their sword pointed down, dealing two hits to any nearby opponents. The move's descent functions as a meteor smash, and the blade itself can pass through thin platforms. The Mii is also intangible during the initial frames of the attack. Skyward Slash Dash (named Super Slash Dash in the PAL release) is the Mii Swordfighter's second up special move in Super Smash Bros. for Nintendo 3DS and Super Smash Bros. for Wii U. When used, the Mii Swordfighter launches themselves into the air with a flurry of sword slashes, dealing multiple hits to any opponents. The move can be used to travel in any direction by angling the control stick. If the Mii hits the ground when the move is used, they will bounce off. The move is similar to Fox's Fire Fox. 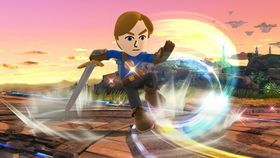 Hero's Spin is the Mii Swordfighter's third up special move in Super Smash Bros. for Nintendo 3DS and Super Smash Bros. for Wii U. Functioning identically to Link's Spin Attack, the Mii Swordfighter charges a spinning sword attack that deals more damage by charging. When used in midair, the Mii rises into the air. Blade Counter is the Mii Swordfighter's default down special move in Super Smash Bros. for Nintendo 3DS and Super Smash Bros. for Wii U. Like other similar moves, the Mii Swordfighter braces themselves, then delivers a counterattack when struck that deals 1.25x damage with a minimum of 8%. Reversal Slash (named Reflect Spin in the PAL release) is the Mii Swordfighter's second down special move in Super Smash Bros. for Nintendo 3DS and Super Smash Bros. for Wii U. 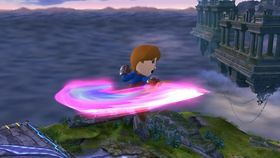 When used, the Mii uses a rainbow-colored sword slash that flips opponents for a small amount of damage and reflects projectile attacks, similar to Mario's Cape. Additionally, when used in midair, the Mii hovers in the air for a brief moment. 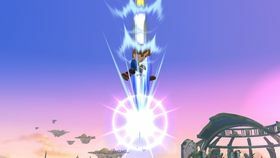 Power Thrust is the Mii Swordfighter's third down special move in Super Smash Bros. for Nintendo 3DS and Super Smash Bros. for Wii U. When used, the Mii dashes forward with their sword pointed out to strike any opponents in their path. Similar to Captain Falcon's Falcon Kick, when used in midair, the Mii dives toward the ground instead. The move deals more damage when striking at the tip of the sword. Final Edge is the Mii Swordfighter's Final Smash in Super Smash Bros. for Nintendo 3DS and Super Smash Bros. for Wii U. When activated, the Mii holds their sword up and fires several crescent-shaped energy blasts in the direction they are facing, dealing repeated damage and pushing any opponents caught in the blasts back, similar to Wii Fit Trainer's Wii Fit. The energy blasts are spread out and can also fly through walls and obstacles. This Final Smash behaves slightly different between both versions of Super Smash Bros. for Nintendo 3DS / Wii U. Final Edge on the Wii U makes the crescents follow a wider path, giving it more vertical range and less accuracy than on the 3DS. In both versions, however, the Swordfighter can release a powerful blow from its sword to anyone really close to it as it initiates the attack, which can KO opponents at moderate damage percentages. 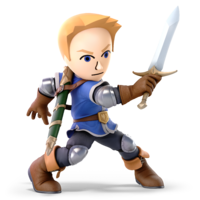 Wii U Super Smash Bros. for Wii U This fighter is based on a player's Mii and favors a sword in battle. Enjoy the extra reach the sword offers, but remember that it takes a bit longer for strikes to reach your opponent as a result. Customize your Mii with chargeable moves, counters, or projectile attacks. A fighter based on your Mii! The main draw of Swordfighters is the extra reach that they get thanks to their swords. On top of that, they have a lot of varied moves to choose from. Unfortunately, a lot of sword attacks have a bit of delay between pressing the button and landing the attack, so you'll need to be very careful not to leave yourself open! Wii U Super Smash Bros. for Wii U One of the Mii Swordfighter side specials actually uses a throwing disc called a chakram! How quickly you press your desired direction controls how fast and far the chakram flies and how much damage it does. Several other moves, like Skyward Slash Dash, also work in this manner. One of the Mii Swordfighter side specials actually uses a throwing disc called a chakram! How quickly you choose a direction controls how far and fast the chakram flies, as well as the kind of damage it does. This kind of quick-aiming action also applies to other special moves, like Super Slash Dash. N/A The Mii Swordfighter will rise its sword, firing multiple shock waves forward in its Final Smash. The waves will expand outward and push foes off the screen. Walls and the ground can't stop this display of power, so this Final Smash is exceptional at taking out several rivals at the same time. With sword held high, Mii Swordfighter unleashes a barrage of shock waves. They spread out in a fan pattern, dealing multiple blows to foes they touch, while also pushing them towards the edge of the screen. This Final Smash can even hit through walls and floors, making it easy to attack lots of opponents at once! Pit: Uhh... What do we have here? Viridi: That's a Mii Swordfighter, Pit. As a general rule of thumb, you should take armed opponents seriously. Which really isn't easy in this case. That Mii is awfully funny looking. Viridi: But Miis are full of special moves, so it's essential to figure out what they're capable of quickly. They often have some unexpected techniques too. If you get careless, you may find yourself in big trouble. This page was last edited on December 25, 2018, at 20:34.